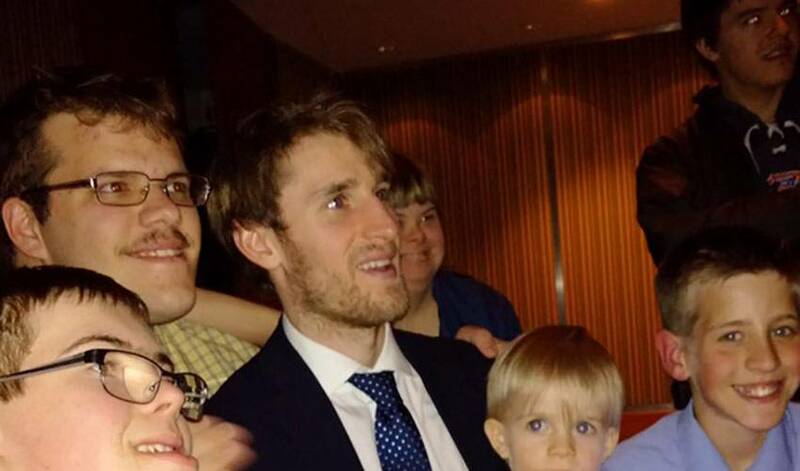 When Kyle Turris walked into the room, kids smiled and parents cried. Jim Perkins did a little of both. 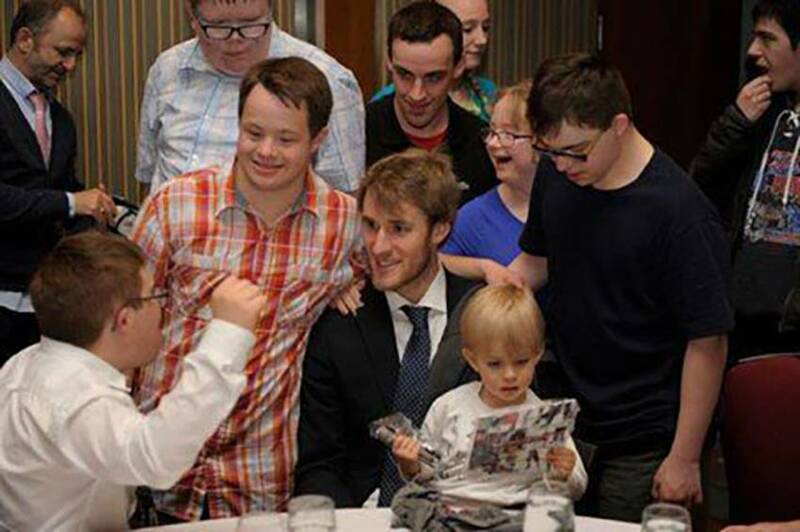 The Capital City Condors, a family of hockey teams for people with physical and/or intellectual disabilities, were holding their end of year banquet and awards night on the same evening that Turris and his teammates were facing off against the Rangers. No one, including Perkins, the Condors co-founder and president, expected to see No. 7 walk through the doors that night. 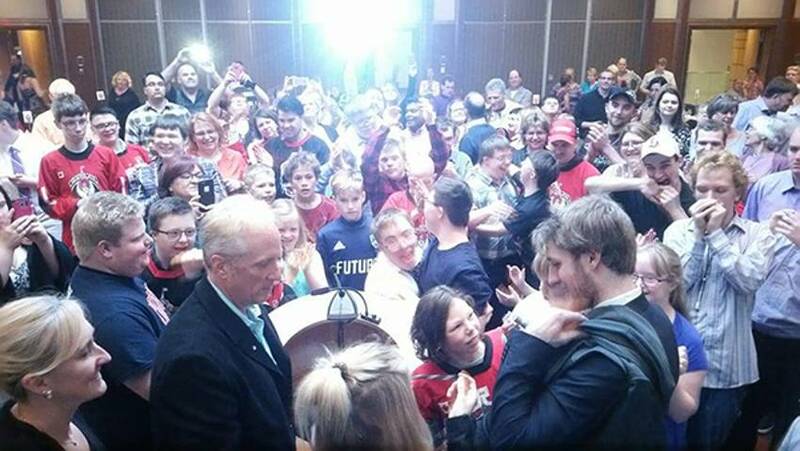 He made an announcement to the large gathering noting Turris wouldn’t be able to make it. Unbeknownst to the 300 people in attendance, the 27-year-old centre secretly had a plan in place. Less than 90 minutes after netting the game-winning tally, Kyle and his wife, Julie, slipped quietly into the banquet room. Their presence didn’t go unnoticed for long. And for Perkins, it’s a perfect example of who Kyle Turris is. He found that out the first time the two met face-to-face at an Italian deli in Kanata. Perkins was optimistic it would go well, considering Turris’ old roommate was Matt Carkner, a former Senators defenceman, who along with his wife, Kary, are huge supporters of the Condors. “We were a couple years in to our program and we still trying to figure out how to meet people within the special needs community beyond what we could do through the school boards and that type of thing,” said Perkins. “We didn’t understand fully how hesitant parents were to sign kids up for something because a lot of programs start and municipalities aren’t able to keep them going, so they get pulled for lack of money or whatever. I think a lot of parents knew that – particularly with hockey – if they gave their kids a taste of it and then it was pulled, it would be harder on them then if they never tried it in the first place. It’s one of a handful of things Perkins was thinking about when Turris came over to his table. Perkins was, admittedly, a little lost for words after the pair shook hands and went their separate ways. Turris, the Condors honorary captain, still is. For the past five years, Kyle and Julie have lent their time and support to special needs hockey in the Ottawa area. Perkins admiration for both continues to grow. There are hundreds of moments, Perkins noted, that perfectly exemplify the bond between Kyle and the Condors families. Two, in particular, come to mind. “One mom said, ‘Kyle doesn’t just hug the kids, he embraces them.’ You can’t fake that. And that’s true, especially with these kids. “They don’t have the same filter necessarily of every kid you’d encounter," continued Perkins. "You can’t fabricate with kids, especially with these kids. So, when you see Kyle with the kids around him and he’s either down on his knee or leans down to look them in the eye, he just stops and talks, calls each one of them by name – he doesn’t just hug them or pat them on the shoulder. That one mom put it most perfectly. I think that speaks volumes. It’s his way of convincing them that they are extremely important to him. I think that represents everything about this. When Kyle and Julie were married, the Condors delivered a heartfelt gift to the couple, one they shared at their reception. Perkins thinks about it often. The feeling is no doubt mutual. The annual Kyle Turris and Capital City Condors Golf Classic takes place on June 5. For more on the Capital City Condors, visit their official website: capitalcitycondors.org/.